You are warmly invited to take part in the 9th International Conference on Urban History to be held in Lyon, 27th - 30th August 2008. 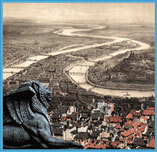 The European Association for Urban History was established in 1989 with the support of European Union. Conferences are organised every two years. These biennial conferences provide a multidisciplinary forum for historians, sociologists, geographers, anthropologists, art and architectural historians, economists, ecologists, planners and all others working on different aspects of urban history. The invitation is extended to all scholars who make urban history a distinctive and innovative subject. Next conference will take place in Ghent (Belgium) 1–4 September 2010. Session proposals are welcome between 1 December 2008 and 1 March 2009.